Russian draughts (also known as Shashki or Russian shashki) is a variant of draughts (checkers) played in Russia and some parts of the former USSR, as well as parts of Eastern Europe and Israel. There are several variants of draughts games based on Russian draughts. Amongst the most popular ones is ″Poddavki″ (Misère game), where a player wins if he doesn't have any legal moves on his turn (either by giving up all of his checkers or having them being blocked). Another popular variant is called "Bashni" ("Towers"), where captured pieces are not removed from the game, but placed underneath the capturing piece, forming a "tower". 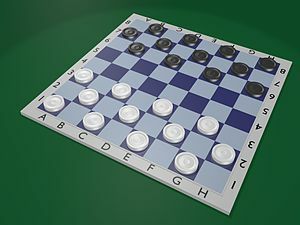 As in all draughts variants, Russian draughts is played by two people, on opposite sides of a playing board, alternating moves. One player has dark pieces, and the other has light pieces. Pieces move diagonally and pieces of the opponent are captured by jumping over them. Board. 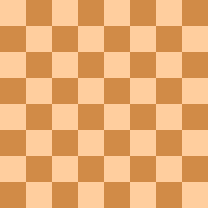 The board is an 8x8 grid, with alternating dark and light squares. The left down square field should be dark. Pieces. Traditionally, the colors of the pieces are black and white. There are two kinds of pieces: "men" and "kings". Kings are differentiated as consisting of two normal pieces of the same color, stacked one on top of the other. Starting position. Each player starts with 12 pieces on the three rows closest to their own side, as shown in the diagram. The row closest to each player is called the "crownhead" or "kings row". The white (lighter color) side moves first. How to move. A move consists of moving a piece diagonally to an adjacent unoccupied square. If the adjacent square contains an opponent's piece, and the square immediately beyond it is vacant, the piece may be captured (and removed from the game) by jumping over it. Jumping can be done forward and backward. Multiple-jump moves are possible if, when the jumping piece lands, there is another piece that can be jumped. Jumping is mandatory and cannot be passed up to make a non-jumping move. When there is more than one way for a player to jump, one may choose which sequence to make, not necessarily the sequence that will result in the most amount of captures. However, one must make all the captures in that sequence. A captured piece is left on the board until all captures in a sequence have been made but cannot be jumped again (this rule also applies for the kings). Kings. If a player's piece moves into the kings row on the opposing player's side of the board, that piece is said to be "crowned", becoming a "king" and gaining the ability to move freely multiple steps in any direction and jump over and hence capture an opponent piece some distance away and choose where to stop afterwards. If an ordinary piece moves into the kings row from a jump and it can continue to jump backwards as a king then the move should be continued. Also if there is a piece in the king's path that can be captured, the king must capture it, provided it's the player's move. There is no choice whether to do it or not, but the player can choose where to land after the capture. Winning and draws. A player with no valid move remaining loses. This is the case if the player either has no pieces left or if a player's pieces are obstructed from making a legal move by the pieces of the opponent. A game is a draw if neither opponent has the possibility to win the game. The game is considered a draw when the same position repeats itself for the third time, with the same player having the move each time. If one player proposes a draw and his opponent accepts the offer. If a player has in the party three kings (and more) against a single enemy king and his 15th move (counting from the time of establishing the correlation of forces) cannot capture enemy king. Official rules printed in Russia in 1884. First Russian championships was held in 1894. In 1993 appear Word championship at Russian draughts as part of World championship in draughts-64 (Russian and Brazilian variant - since 1985) under the auspices of Section-64 World Draughts Federation. Also are European championship at Russian draughts as part of European championship in draughts-64 (Russian and Brazilian) and national championships.